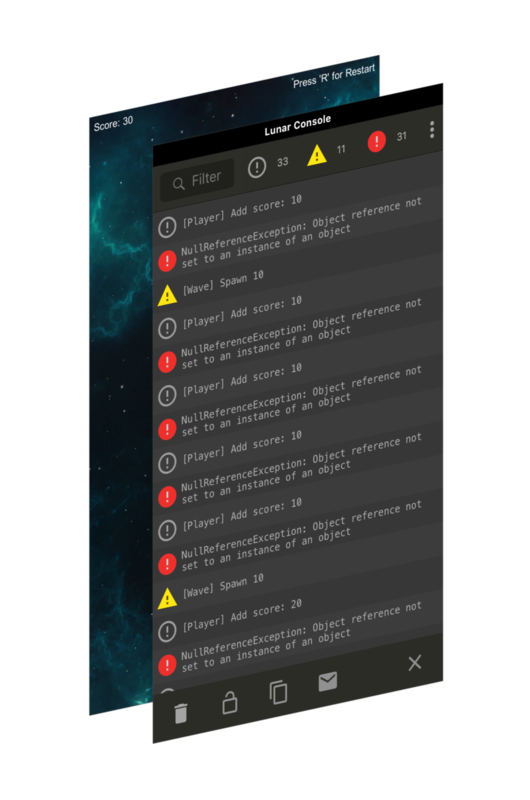 Want to be notified of new releases in SpaceMadness/lunar-unity-console? Requires Unity 5.0 or later. If you enjoy using the plugin - please, rate and review on the Asset Store! 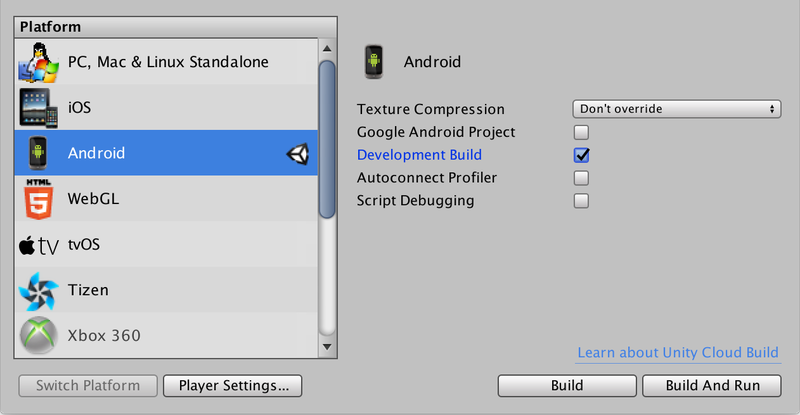 The project goal is to build a high-performance and lightweight Unity native iOS/Android console for ease of testing and debugging. Check Official Wiki for additional information, troubleshooting and guides. Visit Unity Forums Thread for discussions and general questions. Native C/Objective-C/Java code with a low memory footprint. Works well with huge logs amount (up to 65536 entries). 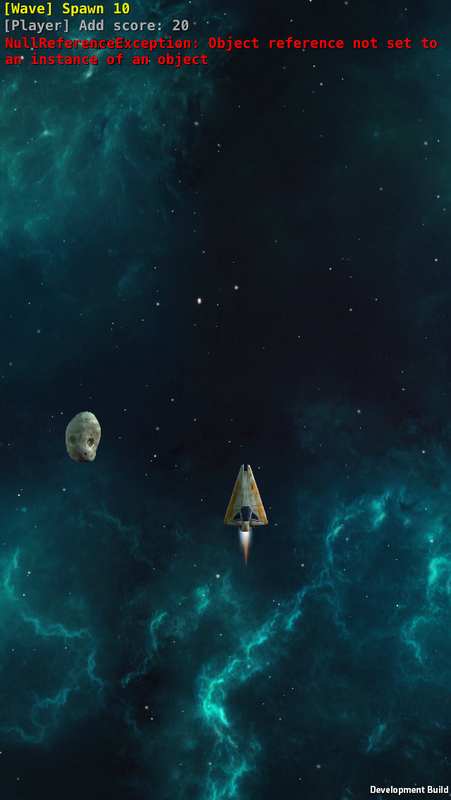 Completely built with native iOS/Android UI (does NOT rely on Unity GUI). Resolution independent (looks great on highres/retina displays). Does NOT modify scenes and does NOT add new assets. Removes completely from the release build with a single mouse click or from command line (absolutely NO traces left). - Copy-to-clipboard and e-mail options. - Automatic updates! 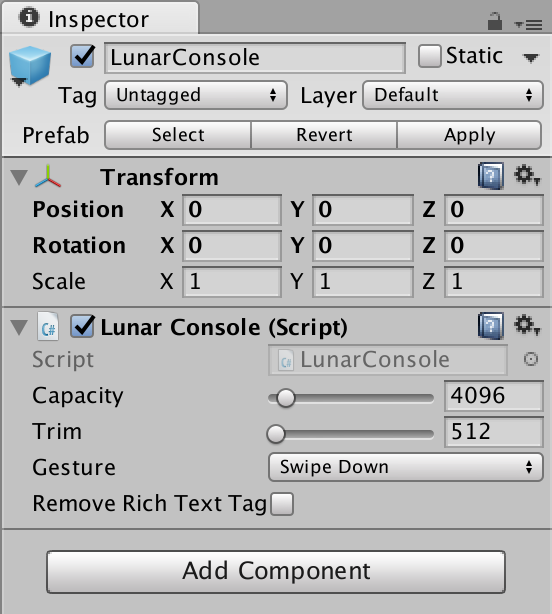 Drag'n'Drop LunarConsol.prefab (Assets/LunarConsole/Scripts/LunarConsole.prefab) into your current scene hierarchy and save your changes. You only need to do it once for your startup scene. You can open the console with a multi touch gesture or using the API call from a script (see API Guide for details). 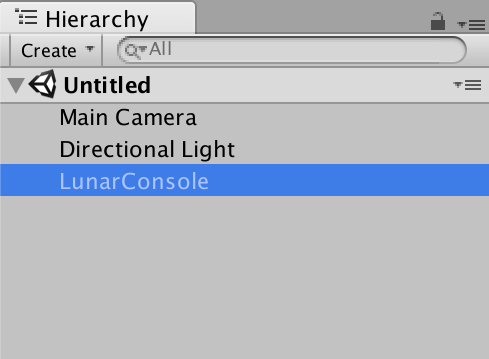 Select LunarConsole game object in the Hierarchy window. Find Lunar Console script settings in the Inspector window. Set the capacity (the maximum number of lines the console can hold). It's advised to keep this amount low (the more you have - the more memory it will take). Set the trim amount (how many lines will be removed from the beginning of the log when console overflows). 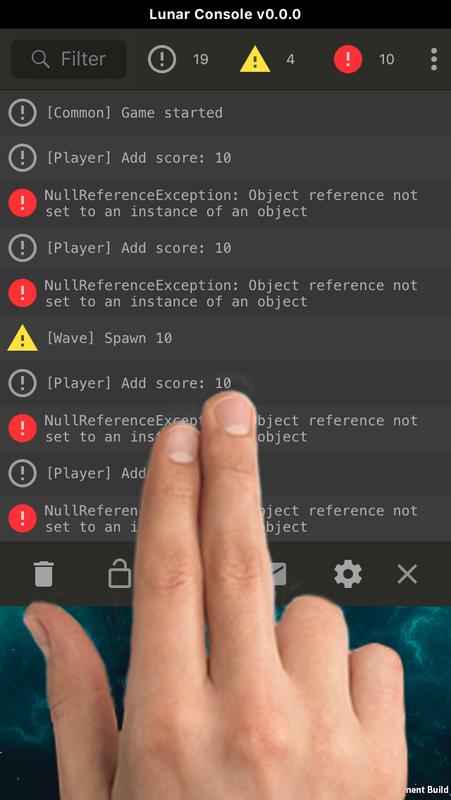 Choose a gesture from the drop down list or select None to completely disable multi touch gestures (you would still be able to open the console from your scripts). Check "Remove Rich Text Tags" to remove rich text tags from the output (may cause performance overhead). For more information on Actions and Variables check the user guide. Touch the log entry to view its stack trace. Important: make sure to properly configure your build settings (File ▶ Build Settings...) otherwise you will only be able to see exceptions traces. 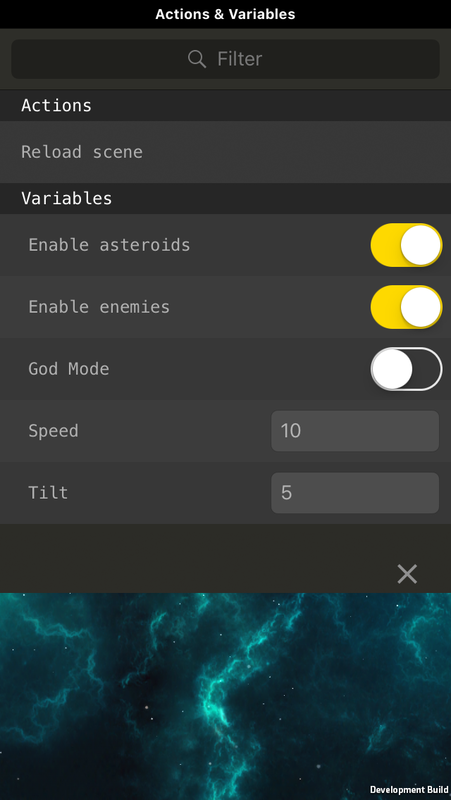 enabled - the plugin files would appear in your iOS/Android build: you can access the console with a multi touch gesture or from a script. disabled - the plugin files would NOT appear in your iOS/Android build: you can't access the console (multi touch gestures or API calls would be ignored). Important: make sure to "replace" your generated Xcode project whenever you switch the plugin from enabled to disabled (or back). Failing to do so may lead to an unexpected result! For more detailed information check Wiki page: Enabling and Disabling Lunar Mobile Console. 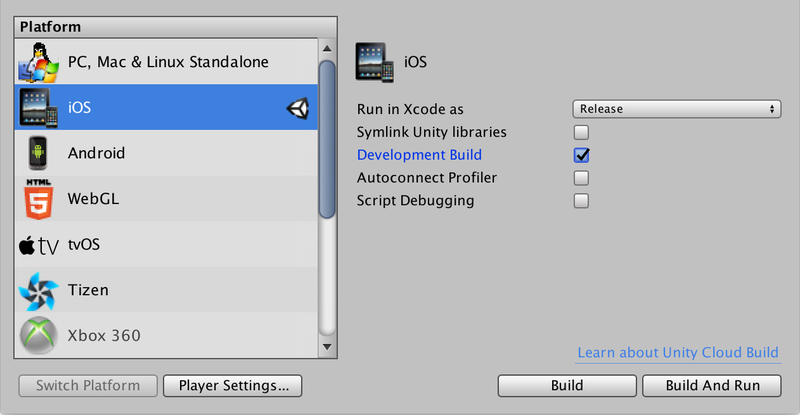 Lunar Mobile Console is fully compatible with Unity Cloud Build. Note: if you're using Lunar Mobile Console older than v0.8.0 (v0.0.1b-v0.7.1) you would need to use LunarConsolePluginInternal.Installer.DisablePlugin and LunarConsolePluginInternal.Installer.EnablePlugin instead. Please, visit the Troubleshooting Wiki page or post your question on the official forum thread. Thanks for using Lunar Mobile Console!